We’d love your help. Let us know what’s wrong with this preview of City-State of Tyr by Walter M. Baas. To ask other readers questions about City-State of Tyr, please sign up. I'm really not sure what's up with that picture on the cover. Surely they could have picked something a bit more evocative of Tyr itself, like Kalak's ziggurat or the arena? And with that auspicious beginning, let me dive in. City-State of Tyr tries to be all things to all GMs, and it mostly succeeds. It's firmly set after Kalak's death in the Dark Sun metaplot, but there's a lot of description throughout the book of the way things used to be back when Kalak was in charge and tyranting all over e I'm really not sure what's up with that picture on the cover. Surely they could have picked something a bit more evocative of Tyr itself, like Kalak's ziggurat or the arena? And with that auspicious beginning, let me dive in. City-State of Tyr tries to be all things to all GMs, and it mostly succeeds. It's firmly set after Kalak's death in the Dark Sun metaplot, but there's a lot of description throughout the book of the way things used to be back when Kalak was in charge and tyranting all over everything, so while it's not oriented toward it, it's certainly possible to use this book as a sourcebook for Tyr before the Prism Pentad takes place. They even spend a page on Kalak's stats in the notable NPCs section, which also contains the first mention of the Green Age by name in a Dark Sun sourcebook. The main part of the book is devoted to a survey of the various regions of the city, often with a focus on how things have changed in the wake of the revolution. For example, the arena still exists, but now it's mostly used as a trading center and the games only take place on festivals. What's more, the games are no longer to the death, instead only being played until one gladiator surrenders unless it's a game vs. animals. The senators still exist as a social class, but the actual Senate has been dissolved in favor of a Council of Advisors to the new king. Though the king isn't actually there because he's off to try to learn the secret of becoming a sorcerer king, after which he can get rid of all this "make slavery illegal" and "free workers in the mines" hippie crap in favor of the old system of brutal repression, because he only appears as a liberalizing figure due to not reading all the edicts he was signing. Also, there's a section of the city called the Warrens where most of the freed slaves live. As the name implies, it's a maze of shoddy construction, crime, and vice, where mobs fight openly in the streets, monsters might live in the ruined houses, and no one sane goes into without guards. Yep, this is Dark Sun alright. On the same hand, there's a note that crime has gone up a lot since the revolution that killed Kalak, which I really like. One thing revolutionaries often find is that it's much easier to overthrow a terrible government than to create a good one to replace it, and I'm glad to see that here even if it could be miscontrued as just more Dark Sun misanthropy. There's also a list of shops and businesses throughout Tyr with a couple paragraphs for each, which should provide plenty of options for an expanded scene for PCs that want to buy anything. Standouts for me were the Tarnished Cup, a pawn shop, which doesn't sound that exciting except that its mere existence reveals a lot about the world; the Shining Sands, a laundry that uses pure white desert sand and cactus-nectar-scented water to clean clothing; the Screaming Cellar, a tavern with a dwarf banshee in its currently-unused cellar who failed to protect the wine down there from thieves; and the Hungry, Hungry Halfling, whose thri-kreen and halfling proprietors swear that the elf stew they serve is not taken from any of Tyr's inhabitants. Cool well water is served throughout the city at little or no cost. except that earlier, the book says that water is free in the morning but it's one bit per container after that, and if you add the merchant's mark-ups, I'd expect water to be more expensive. It's probably subsidized by the city government, but "free water!" 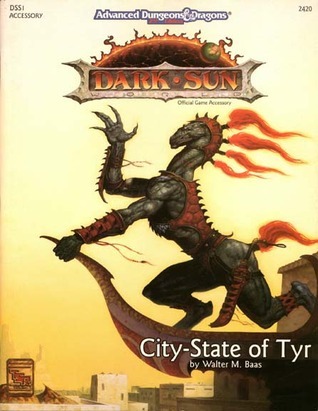 really doesn't sound like Dark Sun to me. There's also a bit about UnderTyr, the network of catecombs, old city buildings, and remnants of previous cities located on the same site as modern Tyr, but not much and no map. I really would have preferred a more extensive treatment, since UnderTyr is perfectly suited for dungeon-bashing, skullduggery, hidden dealings, and all the other things that PCs get up to. The religion and magic section is also short--kind of theme here--but I do like that even though magic is technically legal, wizards who try to use it in public are still likely to be lynched. Centuries of hatred aren't going to be wiped away by changing the law, after all. And the description of elemental clerics make them sound like weird wandering fanatics with superpowers instead of what the average person would think of as a priest, which might not be what they meant to portray but is totally how I'm going to think of them now unless Earth, Air, Fire, and Water has something different. Any maybe even then. The antithesis of the Dark Sun setting, a pacifist priest would make a satisfying meal for a halfling or thri-kreen. There's some odd restrictions, though. Mystic wizards are disallowed because the persecution of Dark Sun wizardry means that wizards can't develop a contemplative and studious mindset...but Dark Sun is the setting with 10th level spells and advanced beings and probably a huge amount of contemplation and study because wizards need to develop a lot of their own spells due to being persecuted all the time. Also, this should have been in the boxed set and I have no idea what it's here.